Two pregnant women, in the moment before embrace. Two children, outstretched arms in welcome. Four lives, bound by the Spirit, present in humanity. God's promise fulfilled. These stained glass windows are part of the Church of Reconciliation, built in the 1960s to accommodate the increasing membership of the Taize community. The design of the stained glass was created by a community member, Brother Eric. The church has since been expanded, each construction effort performed by members of the community. Today the Taize community's ministry focuses on housing the young Christians who gather for celebrations and pilgrimages. The brothers' focus is nurturing and strengthening the youth with their message of peace and reconciliation across religious and ethnic boundaries, so as the young people return to their lives in the world, they may be sustained by the blessings of the Taize community. Brother Eric. 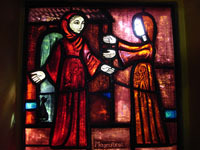 The Visitation, from Art in the Christian Tradition, a project of the Vanderbilt Divinity Library, Nashville, TN. http://diglib.library.vanderbilt.edu/act-imagelink.pl?RC=54191 [retrieved April 24, 2019]. Original source: http://www.flickr.com/photos/swperman/221074981/.